Yesterday, I wrote about ASMedia ASM2362 USB 3.1 Gen2 to PCIe NVMe SSD chip that will allow for connecting NVMe SSD into (largish) USB stick enclosures delivering up to 10 Gbps raw throughput. 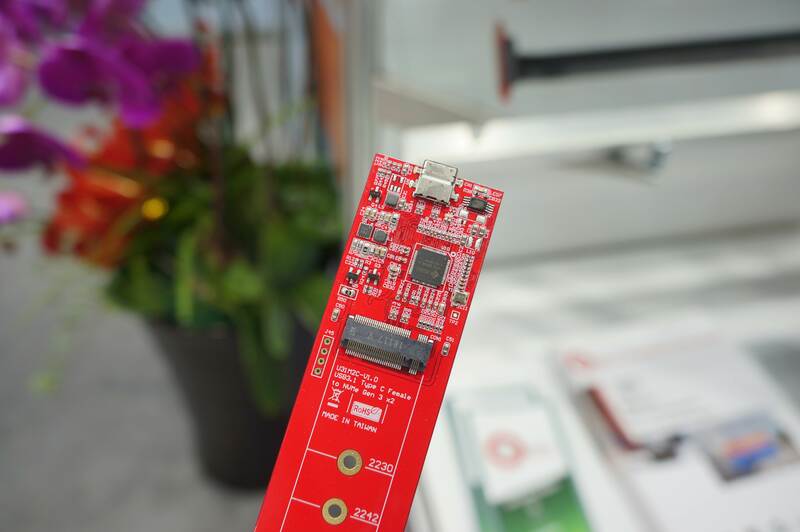 The post generated several comments including that JMicron Technology was also showcasing their own solution at Computex 2018 with JMS583 USB 3.1 Gen 2 to NVMe PCIe Gen3 bridge controller, and that enclosures were already for sale in China. If it is for sale in China, it should also be for sale on Aliexpress, or at least on Taobao. Bingo! 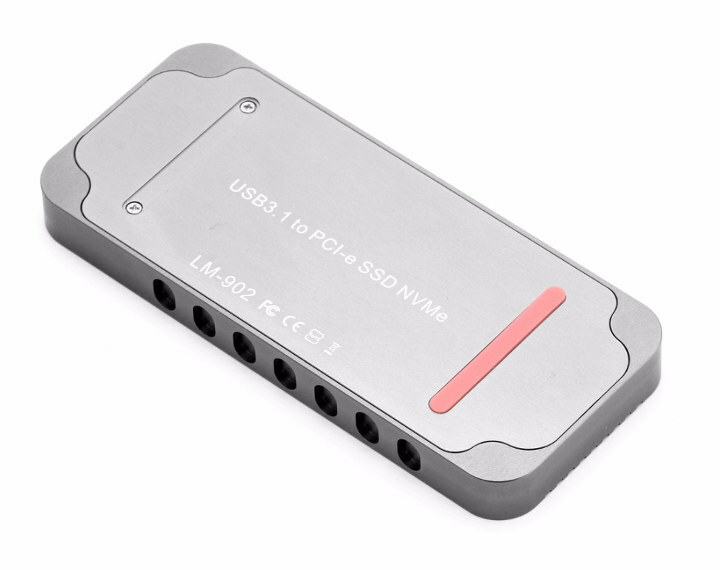 LM-902 “USB 3.1 to PCI-e SSD NVMe” enclosure offers just that for $42.93 including shipping on Aliexpress. 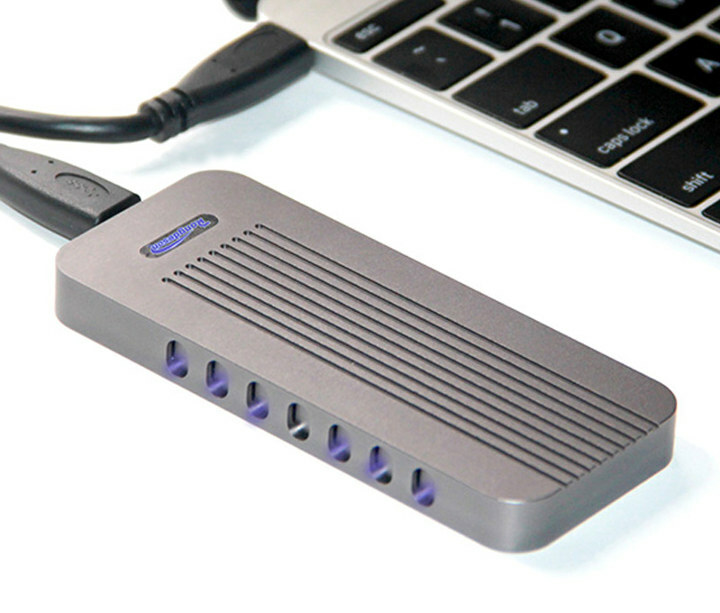 The enclosure should work with any operating systems including Windows 10, Linux distributions, Mac OS X, and appears to ships with a USB type C to USB 3.1 cable, as well as a small screwdriver. The benchmark numbers there are those JMicron showed at Computex but it’s important to note that these were made with an ASMedia USB 3.1 host controller and that numbers when connected to an Intel USB 3.1 host controller are way lower. Also important wrt performance: heat dissipation is a real issue with M.2 SSDs to prevent them throttling down. The JEYI seems to ship with thermal pads to improve heat dissipation. No idea how this works with the LM-902 here. I have a toshiba thnsn5256gpu7 (keyed M) all enclosures are B and B+M can you suggest one that works with that SSD? The above LM-902 or JEYI i9 will do (or any other NVMe capable thingy appearing soon). But beware of the countless issues. Rule of thumb how to deal with USB attached storage: remove the USB component if possible. Since talking about throttling… curious how thermal and SMART readouts in general will work with those USB/NVMe bridges. It’s easy to spot when the SSD runs into thermal problems or how Write Amplification looks like (see last two entries). Also it’s important to read the error log (NVMe Log 0x01). I would guess none of this is possible with those USB/NVMe bridges in between due to the simple reason that neither tools nor protocols are available today to query the SSD inside the enclosure. Wow, I just learned that hosts equipped with USB-C receptacles still only need to provide those 4.5W and the 7.5W and 15W modes are optional. I always thought that USB-C ensures at least 7.5W (1.5A at 5V) minimum. Too bad. So not only trashed performance but also reliability concerns. But since both JMicron and ASMedia controllers utilize only 2 PCIe lanes instead of 4 this may reduce overall SSD power needs (less PHY consumption)? Interesting. Just learned that NVMe supports up to 32 different power states, some of them supposed for active modes with reduced consumption. The SSD tells the host (or USB/NVMe thingy) which power states it supports and the host can set one power state. So PS2 in this case especially when the device is only connected with 2 instead of 4 lanes might be sufficient to cope with a 4.5W power budget. But everything except PS0 is optional, especially older NVMe SSD only support this single/highest power state and it’s still questionable whether 4.5W for the whole setup are enough on a standard USB3 port only providing 900mA. So if you connect a JMS583 enclosure to a Thunderbolt 3 USBC port, the setup is guaranteed to work for any M.2 drive, yes? Second, what about when you connect to the higher-powered (“charge”) USB port on your laptop e.g. Thinkpad, should that give the 15W needed? A question, Jeyi at their JMS583 product pages on Aliexpress state that “TYPE-C [USBC] has stronger EMI suppression”. * what precautions should be taken when connecting a JMS583 enclosure to a Thinkpad? I’m worry about this static electricity issue. How to avoid it? Any other case to recommand?